Employer Aaron is lying. There was a trap in the dungeon. Yes, but did anyone (i.e. only the thief) roll to detect traps? Mike, you forgot to ask about green slime. Can’t be D&D without green slime! They should’ve had Mike Grell working on it. Counting the one I overheard on Wednesday and this one you just recounted just how many conversations about gelatinous cubes were there this week? softball season then return without explanation? 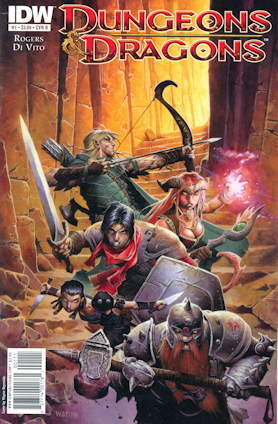 Is this comic gonna finish the storyline of those old D&D ads on the back covers of old ’80’s comics? Did Saren recover? Was their arrival at the ancient castle the end of the quest? I’ve been on tenterhooks since July 1982. Does anyone else feel a little dirty and wrong about the comic being good? A D&D comic shouldn’t be good. This conversation reads like something between a Vaudeville routine and the Monty Python Cheese Shop sketch. Can I have a Mountain Dew? well played mike, well played. you’ll get an XP bonus for this. I have never played D&D. I don’t know anything about D&D. I imagine I would have liked it even more if I liked D&D. It was when I read Tom’s internet comment about how a D&D comic is like a Monty Python sketch, that I suspected this might be some kind of nerd thing. You should check out Order of the Stick – it’s a webcomic that has featured nearly all of those things and is actually very good – speaking as someone who doesn’t care for D&D at all.